critical-care incident in July 2012. 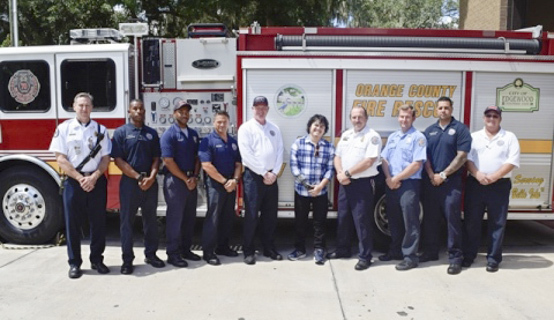 Orange County firefighters reunited recently with a burn patient that they treated in July 2012. Following a violent accident that resulted in a fully involved car fire, Nam-Hai Le made it his mission to locate the crew who tended to his injuries at the scene and thank them for their care and extraordinary efforts that ultimately saved his life. The crew determined that the patient required a trauma care due to his life-threatening injuries. Several years later, they were astonished to learn the patient’s outcome because the man’s recovery was not expected to be favorable. With the help of social media, the patient finally connected to the lieutenant who assisted in treating him on the scene. The patient and crew embraced the opportunity to meet and once again recount the critical moments of that grim July night and to celebrate the life of a young man who was involved in a tragic accident. The reunion took place at Fire Station 70 and included crew members who were on the scene and responded to the accident. During the reunion, the patient and crew spoke with local media about this young man’s inspiring story. The crew received a Unit Citation Award for their dedicated efforts and extraordinary patient care. For more information about Orange County Fire Rescue, as well as emergency and safety information, visit www.ocfrd.com or contact Public Information Officer Kat Kennedy by calling 407-836-9074.